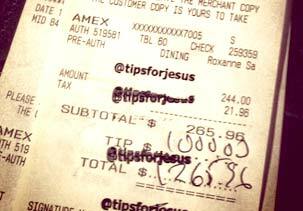 'Tips for Jesus' Big Spender Unmasked? Reports say the generous benefactor behind the huge gratuities is a former PayPal executive. The New York Post is reporting that, "Tips for Jesus," the mysterious person leaving thousands of dollars in tips at restaurants across the country, is Jack Selby, a venture capitalist and former vice president at PayPal. According to The Post, Aruj Dhawan, a waiter at Bo's Kitchen, confirmed that Selby and another man and woman had visited the restaurant in New York's Chelsea neighborhood late on Saturday night and left a $1,000 tip on a $111 bill. "As I was about to drop the check off, one of the men said they would, 'make my night.' They called me over, gave me the check -- I was amazed," Dhawan told the Post. "They took a picture, (with me), and literally, just like that, they walked out." The mysterious tipper has previously taken credit for tips worth thousands of dollars at restaurants in Los Angeles; Ann Arbor, Michigan; and South Bend, Indiana. Sam Biddle of Valleywag reported last week that Selby was responsible for the extravagantly generous tips, though he didn't cite any specific sources. It would make sense if it turns out Selby is behind the project. As one of the original PayPal executives, he's known to have made a good deal of money when the online payment company was sold to eBay in 2002. Selby hasn't officially revealed himself, though in November, he took to Facebook to share a South Bend Tribune article about the, "Tips for Jesus," Instagram account. It is still unclear whether there are more people involved, though it seems likely, given the variety of locations where the tips have appeared. Re: 'Tips for Jesus' Big Spender Unmasked? That's an awesome way to make someones night. I cannot imagine the waiters'/waitresses' shock after a day of being treated like crap by some assholes and stiffed out of tips the way they run around! Is this suppose to make up for the recent surge in online receipt fraud by servers? Or is there finally, a modern Christian trying to live up to their namesake?